Have you ever seen the Super Dogs and wondered how they got started? They all started by learning the game of agility and doing agility foundations exercises! 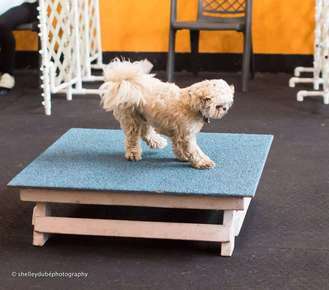 In this class you and your dog will be introduced to the foundation exercises and equipment used to get you started with the basics of the game of agility! We will play foundation games with cones, wobble boards, target plates and more. Your dog will learn to perform tunnels, regular jumps, tire jump, low dog walk, pause table and the A-Frame. We will create a fun experience using positive techniques for teaching the foundation skills and equipment performance to keep it fun for you and your dog. Bring lots of soft treats as this is a positive food reward based class. You may also want to bring a dog mat and chewy for your dog to relax with in between turns. This class will be a mental and physical workout for you and your canine partner – agility is a team sport! Come prepared to work with your dog and have some fun! Prerequisite: Your dog must be over 12 months of age and have successfully completed a beginner program in order to register and attend this course.